The top end of Quay Hill at Lymington in Hampshire. 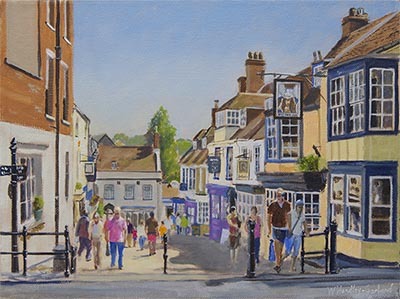 This picture will be available to view and buy at the Romsey Art Group Spring Exhibition – see Events page for more details. This entry was posted in For Sale, Oil, Paintings, Urban and tagged For Sale, Oil, Urban on April 9, 2019 by admin.